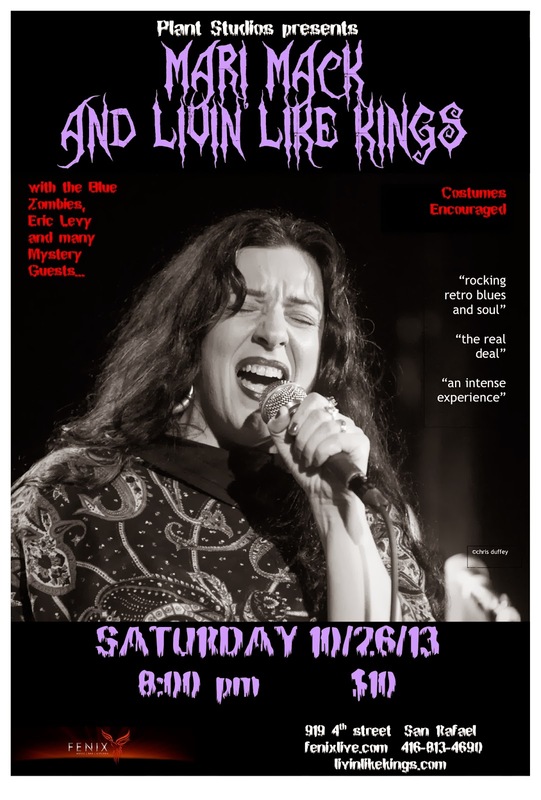 Mari Mack Music: October 26th at The Fenix : Costumes Encouraged! October 26th at The Fenix : Costumes Encouraged! Long time no post. Hope this email finds you well. Please visit my blog and let me know what you think of the new look. 2013 is flying by - hard to believe it is October already! Next Show: October 26th at The Fenix! extra bonus is I get to sing this time! Woohoo! Just so you know - our King Pat (Duffey) has another gig in the midwest on that night, so he will not be able to join us for this one - but on a positive note, our good friend and original "King" on keys, Eric Levy will be back in the lineup for this one show! Eric, as you may already know, is best known for his work with Garaj Mahal and the fact that he has been on tour with Nightranger for the past year. Eric also helped to arrange some of the tunes on my "Can't Go Back" CD and is a co-writer on one of the tunes on the upcoming record. We are really excited to be jamming with him again. Costumes encouraged, but not required - just a good attitude and a willingness to enjoy yourself!